Launching a consumer product or service requires research, planning, ingenuity, creativity, knowledge of the consumer and great follow through. 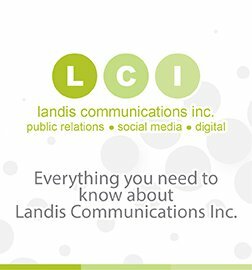 The Landis PR team has decades of experience launching products and services in multiple industry sectors (retail, fashion, beauty, consumer technology, food/beverage, real estate, airlines, financial services and more) as well as services (online learning, online dating, online commercial real estate transactions, etc.). LCI’s list of relevant service / product launch clients includes: Old Navy, Match.com, Whole Foods Market, Selequity.com, Cold Stone Creamery, Emirates Airline, Biscoff Cookies, MetLife, California Bank & Trust, Maxthon (browser) and luxury homefurnishings client Native Trails, among others.